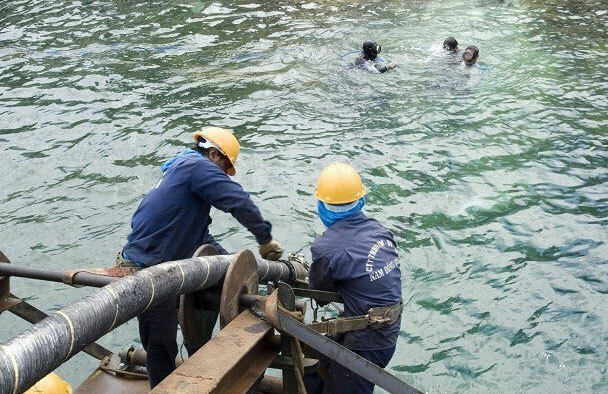 Repair work on the Asia-America Gateway (AAG) and Asia Pacific Gateway (APG) submarine fiber optic cable lines has been basically completed, said a representative from the Ministry of Information and Communications. The two submarine cable systems suffered problems and were shut down nearly two weeks ago. According to Nguyen Duc Trung, General Director of the ministry’s Telecommunication Department said his agency has directed relevant enterprises to swiftly overcome the problem. The repair ship could access the waters where the damaged cables are located, he said. Telecommunication enterprises have worked with foreign partners to switch connection, completing about 80-90 percent of the work. The Vietnam Post and Telecommunication Group (VNPT) said the APG line’s operations have returned normal and the connection on the AAG system will recover by January 27 or 28. The military-run telecommunication group Viettel has coordinated with its partners to address the problem, basically meet customers’ demand for Internet service. Deputy Minister of Information and Communications Phan Tam has asked the Telecommunication Department to enhance supervision and inspection of ways to improve the service quality of relevant enterprises after the breakdown. In 2016, the 20,000km-long AAG cable was disrupted four times and maintenance work had to be undertaken in March, June, August and September. The AAG, one of the four intercontinental internet cable systems of Vietnam, is used by major local providers, namely, FPT Telecom, VNPT, Viettel and SPT. The AAG cable came into use in November 2009, directly connecting Southeast Asia and the United States. It also links Southeast Asia with Europe, Australia and Africa. Meanwhile, the APG, which connects mainland China, Hong Kong, Taiwan, Japan, the Republic of Korea (RoK), Malaysia, Singapore, Thailand and Vietnam, boasts a capacity of 54 Tbps, the highest of any network in Asia. It is also 20 times more than the AAG. Initiated in 2009, the APG is a partnership between Chunghwa Telecom (Taiwan-China), China Telecom (China), China Unicom (China), KT Corporation (RoK), NTT Communications (Japan), PLDT (the Philippines), Telekom Malaysia (Malaysia) and VNPT (Vietnam). Previously, the APG cable system snapped and the damage was spotted near Hong Kong on January 10. However, the issue was resolved the same day. However, the system faced troubles again on January 11, causing discontinuation in connection from Vietnam to Hong Kong, Singapore and the US, affecting Internet speed in Vietnam. Network providers will expand transmission channels to ensure connectivity this year. The Asia-Pacific Gateway undersea cable system is expected to help double the country’s internet traffic to other countries. The Asia Africa Euro 1, connecting Asian countries to Europe and Africa, is also under construction and is expected to become operational this year./.